What’s The Problem Between Paul Pogba And Jose Mourinho? 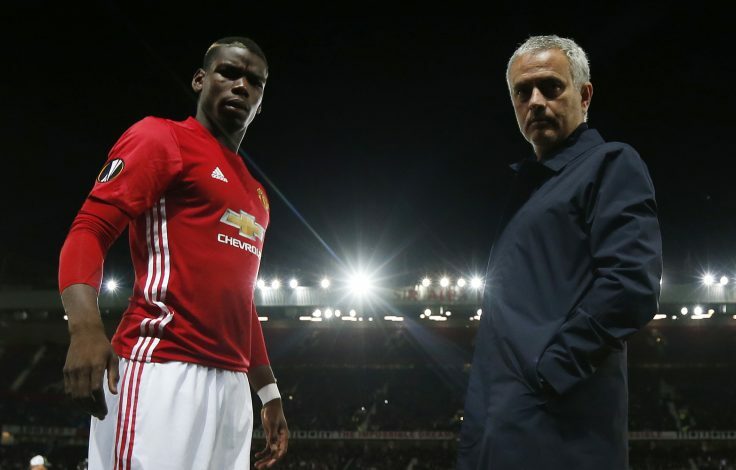 Jose Mourinho is reportedly under the microscope in regards to his deployment of one of Manchester United’s top players, Paul Pogba, in his line-up. With just one win in their last three Premier League fixtures, Mourinho’s side has gone way off to challenge for the title, and instead, the team has now entered a battle to stay in the top four. And one the major talking points from all these three games has been Paul Pogba. The Portuguese tactician didn’t use the Frenchman for the full 90 minutes during the clashes against Tottenham and Newcastle, and dropped him altogether against Huddersfield at Old Trafford. As per the report from Daily Record, the Special One is unhappy with the former Juventus star because of his ‘failure to adhere to tactical instruction, both in his defensive contribution and when in possession of the ball’. Meanwhile, Pogba wants his boss to change the side’s formation in order to give him the freedom to play in a more attacking role on the left side of a midfield three. It was claimed that the 24-year-old ‘believes his ability to impact matches has been limited by the defensive duties he is expected to perform’. The duo’s clash has somewhat disrupted the regular proceedings at Old Trafford, and a shocking loss to Newcastle last weekend has worsened the situation. After the disappointing display, Mourinho was bombarded with questions specifically related to Pogba, and he answered the one which was from former United captain Wayne Rooney, who had earlier mentioned that ‘Pogba would be best deployed as “box-to-box” midfielder liberated from defensive responsibilities’. Mourinho said: “In relation to his best position I had a few laughing over the past week because I heard, I watched, I had a chance to read a few things. I’m not English, but I think I understand English enough to understand what you want to say with ‘box-to-box’. “But with some comments from important people in football, I got a bit confused. Because for me box-to-box means box-to-box. And means you have to be good in this box, you have to be good on this road, and you have to be good in that box. “Means that you have to defend well in this box, you must have the physical condition, the desire, the intensity, the stamina to go until the other box. In the other box, you have to be good at scoring, creating, heading and so on. And then when your team loses the ball, you have to go to the other box because I think this is the meaning of the ‘box-to-box’.